They may have lost two games during the group stages but Spain showed that it is always best to win when it really matters. 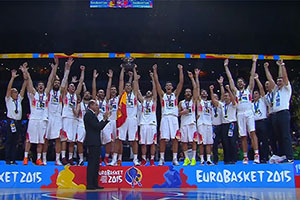 The Spanish side were in full control of the EuroBasket 2015 final against Lithuania and they were well deserved winners. It was a match where the Spanish defence showed that they can stand tall and strong with Lithuania struggling to get into the game. The Lithuanians have been involved in some nail-biting matches in the tournament but in the final, they couldn’t stay close to the Spanish side that managed to race away with a strong lead long before the game finished. A 19-8 score in the opening quarter set the tone for the game and even though Lithuania managed to take the second quarter, the Spanish were still in the lead at halftime and they moved on from that point. The third quarter saw Lithuania limited to just 10 points, while the Spaniards racked up 19 points and the final quarter was tied 20-20 as Spain did more than enough to keep their opponents at arm’s length. 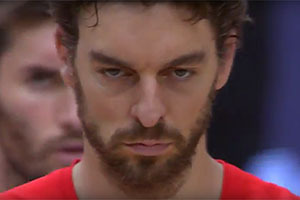 Once again, Pau Gasol was the man of the evening with 25 points and 12 rebounds. The consistency from Gasol during this tournament has been of the highest standard but in all honesty, this is the mark of a player that has been at the top of their game for a number of years. Gasol’s experience in the NBA, and his two titles in America, means that he is the player that stands up to be counted for big matches and Spain know that they have a player who can take the game by the scruff of the neck. Sergio Llull grabbed 12 points and Rudy Fernandez provided 11 points for the winners, so it is not as if Spain are a one-man band, but their big game players are ones that pop up time and time again. Renaldas Seibutis offered 13 points and 4 rebounds for the losing side, who claimed the silver medal, but it wasn’t to be for the Lithuanians who have not lost two EuroBasket finals in a row. A record crowd of 27,372 were in attendance at the Pierre Mauroy Stadium in Lille and it was a historic night for the Spanish side. This win was their third European triumph in four tournaments, marking them out as being one of the leading European teams of the past decade. We may be reaching the end of this generation of Spanish superstars but if it is to be the last hurrah, they will have bowed out in great style. This is the third triumph for Spain in the EuroBasket tournament, and this places them in third place in the overall list of winners. Mind you, the Soviet Union sit at the top of the rankings with 14 wins, 3 silver medals and 4 bronze medals. In second place is Yugoslavia with 8 wins, 5 silver medals and 4 bronze medals. After this, Spain have 3 winners medals, 6 silver medals and 3 bronze medals. With these three winners medals coming in the last 4 tournaments, you can see why there is a widespread feeling that this era is the golden era of Spanish basketball. The fourth placed team in the rankings are the losing finalists, Lithuania. Lithuania now stand with a 3 winners medals, 3 silver medals and a bronze medal. With both of these teams guaranteed to be in Rio next summer, they will be gunning for medals once again but for now, all of the glory lies with Spain, winners of the 2015 EuroBasket tournament.